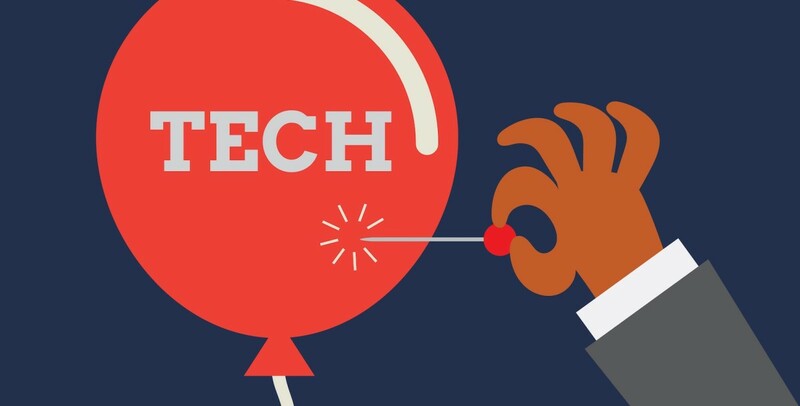 Silicon Valley is preemptively reacting to a ‘bubble’ that hasn’t popped – a bubble that only exists in the business-to-consumer (B2C) tech world. While most business-to-business (B2B) startups launch with a plan to make money (a.k.a. a monetization model), social content ‘unicorns’ are in race between record-high burn rates and eye-popping user growth. They have one viable option: a fairytale acquisition. This is unsustainable, and it is inflating the bubble. My hope is that VCs will recognize this and force social content startups to create monetization models before they raise capital. Either way, the B2B tech ecosystem will thrive, and investors will find their unicorns at the intersection of multibillion dollar industries. Yahoo, for instance, paid $1.1 billion for Tumblr’s user base, believing that eyeballs equal ad revenue. Despite bullish comments about user growth from CEO Marissa Mayer, this hasn’t panned out. Yahoo hasn’t shared any news indicating a return on investment. If Yahoo spends $900 million on Foursquare, a company that is suspiciously vague about its financials, it’s hard to imagine a different outcome. For most social content startups, a revenue model is an afterthought. Snapchat, valued at $16 billion, brought in just $3 million and lost $128 million in 2014, according to documents leaked to Gawker. Shazam has joined the $1 billion valuation club despite not being profitable. Pinterest, valued at $11 billion, hasn’t released any reassuring revenue numbers. Tinder, valued at $1 billion, is not profitable either. What are they aiming for if not an acquisition? If Yahoo, Twitter, Google and their kin can’t generate a return on unprofitable companies, they’ll stop acquiring them. Investors will grow reluctant to fund ‘the next big idea’. The stranded unicorns will either find a revenue model or run out of cash. That’s the bubble. Most B2B companies will survive the B2C bubble because they have business models. Whereas B2C content startups create an addictive but free experience, B2B businesses solve a problem. They drive efficiency, revenue and profit for another company. They tend to target cash-rich enterprises in the Fortune 1000. If they can’t acquire paying customers, they can’t raise a dangerous amount of capital at absurd valuations. The B2B space is bubble resistant. In B2C tech, consumers run from shiny thing to shiny thing without repercussions. What are the consequences of leaving Twitter for Snapchat, or StumbleUpon for Digg? The only ‘problem’ they solve is boredom, an increasingly precious commodity. In contrast, the nature of the enterprise market is that no one can disrupt it overnight. This is advantageous both to investors and entrepreneurs. New trends are easier to spot and slower to gain momentum, so B2B startups can adapt to competition. Once a SaaS platform becomes integral to a company’s operation, the users won’t abandon it on a whim. In response to this argument, you might point out that areas of B2B tech are bloated. For instance, there are roughly 2,000 marketing technology companies spanning 43 categories. If many do the same thing (e.g. social analytics), don’t the majority have to die off? Nine out of 10 startups supposedly fail, so the odds are against every new company. However, B2B companies with a monetization model can survive with $20 to $50 million in revenue, low overhead and loyal customers. Overvalued B2C startups with a freeloading user base don’t have that fallback plan. If the Bubble pops, the B2B casualties will be those that sell B2C eyeball machines instead of sustainable industries. The B2C bubble will either pop, or, hopefully, deflate slowly as reason overcomes “FOMO” (fear of missing out). Either way, the B2B space will graduate unicorns that make money. You will find them where two or more multibillion dollar markets converge. Take $125 billion data analytics industry, which is enveloping the $40 billion market research space. Market research increasingly depends on analytics instead of focus groups, surveys and other analog processes. Most analytics solutions just make data correlations look pretty. Startups that understand this convergence are producing tech that can distinguish causation from correlation. That’s unicorn turf. At the intersection of the $3 trillion healthcare industry and video conferencing vertical, there will be a telehealth unicorn, too. The cost efficiencies and convenience are obvious. Telehealth could bring professional healthcare to patients in underserved areas and crisis zones where cell networks are more plentiful than doctors. It could also save elderly patients from stressful, accident-prone trips the hospital. The industrial world is loaded with intersecting trends. For instance, the McKinsey Global Institute estimates that the convergence of manufacturing and the “Internet of Things” will have a $1.2 to $3.7 trillion economic impact on factories by 2025. In all the above examples, unicorns will disrupt established industries that address real rather than imaginary human needs. Social content startups have high burn rates, delusional valuations and acquisition fantasies that threaten the entire B2C ecosystem. On the other hand, most B2B startups launch with a monetization plan. They can’t raise excessive venture funding without proving that companies will buy their product. Still, it wouldn’t be fair to bash social content startups without proposing what they could do to build sustainable businesses. First and foremost, B2C startups need to launch with business models. Potential advertising revenue isn’t compelling enough. Why are startups so afraid to charge a subscription fee or use a micropayment strategy, like mobile game developers? If no one would pay for your service, are you sure you’re fulfilling a need? Second, social content businesses should borrow a play from Facebook: build platforms that become so integrated into daily routines, that the experiences and life become indistinguishable. Snapchat feels like a novelty next to Facebook, which allows people to communicate, plan events, and document their lives without arbitrary rules. Self-destructing photos are a fad. Based on Twitter’s flat lining growth, 140 characters might be a fad, too. Look at the devices and apps you personally use: how many are indispensable? Investors who fear missing out on the next WhatsApp will continue to inflate the bubble. It will continue grow until reason is resurrected. The B2B world be just fine.